Select your sign and get your daily, weekly, monthly horoscope to the past, present or future. 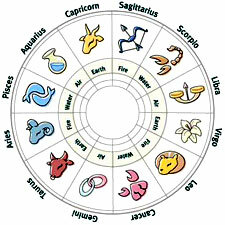 Select your sign and get your Western horoscope for different time frames in future or past. Select one of 16 horoscopes types, i.e., for work, career, travel or flirt. Women will most likely use romantic, teen or love horoscope types. You can also choose different combination, i.e., Next week - romantic , Last month - work, Daily flirt - today, tomorrow or yesterday and the like. New texts are prepared by specialists for Astrology and added regularly (approx. 2 thousand words a day). All your horoscope settings are saved and reloaded after your open the horoscope page again. Descriptions are made up with nice animated horoscope pictures. Don't forget that, you can choose between Spanish and Chinese horoscopes versions too. Works well in all sizes.